Plenty of those lovely spiders that live in curled leaves. Back at home. Phew! Survived the retreat without saying or doing anything embarrassing. After greeting the man, it was into the garden to survey, prod, determine progress, revive. Here are some things I found. All is well with the universe! And the big round spider is in its usual little nook on the eucalypt. Laurie (or is it Keats?) still dropping in. The radish and the rocket I planted in seed form on Saturday are already up! - this is the radish. Here I am in a hotel room up the coast from Sydney at a work 'retreat'. But my real retreat is my backyard, my lovely husband and cat. This is not restful at all, hotel beige, the over cholrinated pool sting to the nasal mucous membranes, the impossibility of letting your guard down after 7 hours cause you are still technically at work. No post-work revive by walking thru the garden, no Harriet pat, no man cuddle, no therapeutic chopping. And no picture to add to the blog. Busy day in the garden and at the sewing machine. A bit like funkbunny, I grow, cook and sew. I promise not to bore you too much with my sewing - perhaps just the occassional entry. But garden first. It was a beautiful day in Sydney town - the kind of day we have been hanging out for. Sunny and hot enough to get up a sweat in the garden. I put in some quick crop seeds - radish, rocket, basil and lettuce and some others that will be staples over the winter - snow peas and fennel. It 's the kind of weather that, if you listen carefully, you can hear the seeds swell and sprout. I also decided to take the tarragon out. It is a lovely plant and a tasty herb but I seldom use it and over several years it has spread far and wide. I decided I could use the space more productively. Then onto maintaining the non-vegetable garden with a massive amount of weeding, transplanting of ferns, pruning the lilli pilli and mowing. If that wasn't enough busy-ness, I also made bunting! A work mate is having a baby girl soon and thought that this would make a nice present. Here it is! Shhhh! Don't tell her, it's supposed to be a surprise. Some of the material was left over from making a summer cotton frock (that's the paisley) the rest I bought from one of the many fabric shops in Marrickville (I got a discount cause I am a regular!). Dinner is Marrickville fresh spring rolls. Prepare everything ahead, one by one soak the rice paper and lay out. Don't leave the paper in the water too long, I just dip it in and then take it out. It starts off a little firm but soon softens and by the time you have put the filling in, its soft enough to roll. Place filling on the rice paper and roll tucking in the bottom. I leave the top loose. I made this Thai-style sauce to go with it. Wiz all ingredients, taste and adjust the sweet, sour, salt balance according to your taste using the palm sugar, lime juice and fish sauce. While this is a good sauce, I am not convinced that it was a good idea to have it with the rice paper rolls. (Never mix 2 different Asian food styles perhaps?). Does any one have a good sauce to use? Second week in a row Friday afternoon post-work cooking therapy is required. I decided to pickle more chillies - quick, easy and able to be done before dinner. Last week I did just the same but made a Chinese rice wine version. Today I decided to use red and white wine vinegar (only cause I didnt have enough of either one to use only one type and so mixed them!). Cut up the chillies - I left the seeds in this time! Take the skins off a couple of cloves of garlic. Prepare a saucepan with vinegar and olive oil to about 1/4 of the vinegar. Bring to the boil , add chillies and garlic and cook for a minute or two. Put into sterilised jars. With summer drawing to a close, here are some of my reflections on the season. It was unusually wet and cool for a Sydney summer, it came as a huge shock after many many years of drought. Dorathea McKellar knew about El Nino and La Nina long before they had terms to describe them (I love a sunburnt country a land of sweeping plains, of ragged mountain ranges of droughts and flooding rains...). La Nina is to be celebrated - it saves my skin from added skin cancer risk and more freckles and it fills the tank and means that you dont have to get the hose out and water! My oft commented upon eggplants have been a slighly lighter colour purple this year and have had a soft light and fluffy flesh with few seeds. I wish I had paid attention to their particular variety - I want to grow them again. Or was their fluffy seedless flesh because of the plentiful rain? Eradicate the stink bugs when they are green babies and destroy them imediately! Even better, search your citrus for their lovely clear eggs and smash them before they can emerge.This way you might have a lime crop. Wear goggles when destroying stink bugs I got sprayed in the eye late last year and had to go to the optometrist to make sure I wasn't in some serious trouble. Tip - irrigate your eye imediately if you get sprayed and you will save your eye. Hosing the aphids off the backs of the leaves of your cucumber works! It uses a lot of water but it's better than spaying with other things and it's a La Nina year so I have lots of water. 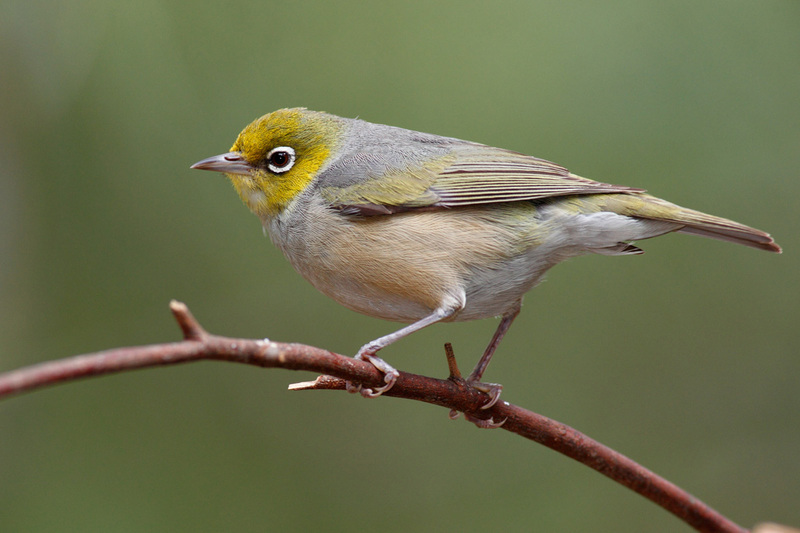 Silvereyes (they are very sweet little birds) are great early season pest controllers in your tomato patch. They search your tomatoes for green grubs and feed them to their babies. They also sometimes take a little nip. Welcome them with open arms. Even if they nip your fruit. I can share with lovely birds. Glue traps work for reducing fruit fly. I love them! No matter how many glue traps you have, you will still have fruit fly. Plant one zucchini and one zucchini only. Pick them young and eat them quick while they are at their best and have a miriade of recipes. I have really enjoyed the ones I have used this year and no longer consider the zucchini a pest. Pick your fruit before it rains lest it split! Learn how to eat split fruit in a La Nina year. My brown berries are more fruit fly resistant than the red varieties. Give up on growing large tomatoes in Sydney - fruit fly is too much of a problem. Prune your plants a little in a La Nina - this will help to ripen the fruit. Don't prune in a El Nino, your fruit will get sunburnt. Same goes for your skin really! Grow them, love them, preserve, pickle, freeze, jam and eat them. They are one of life's great pleasures. Next year grow padrons, pick them, fry them and eat them with salt washed down with fino. curled parsley doesn't like La Nina as much as Italian. Dont be afraid of pickled beetroot. They like La Nina better than El Nino. I got home a little late for my daily ritual of post-work garden adoration. Instead I cracked on with dinner. What better to deal with the remaining tomatoes and the prolific herbs than version 2 of Tomato Herb Pasta. Here is oven roasted version 1. Cook pasta until al dente, drain. Toss with olive oil and half the herbs and the black olives. In a frying pan, heat olive oil and add garlic, anchovies and chilli, infuse the oil with the flavours. Add tomatoes and remaining herbs until heated through. The anchovies kind if disappear and just give you a little saltiness. If people dont like then, don't tell then they are there. It's a secret you and I can keep. Top the pasta, herb and olive mix with the tomato mix. Not sure that flash photography makes it look very nice but it was delicious! chillies - they just keep coming! tomatoes - just brown berries now but gosh they are lovely! Despite three days of some pretty heavy rain and flash flooding in some parts of Sydney, the garden is looking great! It is draining nicely, I must be doing something right. The broccoli seedlings didn't suffer at all (I thought they would have drowned) in contrast they are booming along. The spring onions are nice and firm and the beans have started to produce - I keep picking and eating them in the garden so far none have made it inside. Amazingly the brown berries didn't split with the rain. Why is that? When I had the yellow currant ones and the sugar lumps in - they split. Maybe the soil is better draining under the brown berries? That's my theory anyway. More eggplant on the way - I will save you from more eggplant pictures today... And, I think I have managed to beat the aphids on the cucmber with my 'spray the blighters off with the hose' trick. And the heavens helped too with a couple of torrential soakings and by filling up the tank after my wasteful use of water pest control method. Tonight some of the eggplant will be used up in the often cooked Chinese Spicy Eggplant dish. We cook it so often but am I bored? Not one bit. David is the chef! Mmm can't wait. I pulled out two sugar lumps and one broad yellow ripple currant tomato plant today - they were getting sad as previous posts said. The space left had few weeds due to a good mulching and I dug the sugar cane mulch in along with a bag of manure. I will let it sit for a while before planting - probably fennel and a quick crop of radish and rocket? We will see what I feel like when I get to it. I have plenty of seeds of both of these anyhow. I also decided to try to do something about the massive aphid attack on the cucumbers. One plant - the older one - was too far gone. The other, a younger plant I deemed savable and used a technique I read once in a Jackie French book - hosed the damn things off from the underside of the leaves. This is something I wouldn't normally do... but I don't normally have such an aphid attack. Perhaps it is as a result of La Nina? Lots of sappy growth to tempting for aphids to resist? In which case then La Nina is the solution as well - use the plentiful tank water to give them a blast! Let's see if that improves things. Where are all the lady beetles when you want them? The extra heat and sun of the day pushed 8 more eggplant into pickability. It will have to be a serious week of eggplant eating to get thru the stash that is occupying the crisper draw of the fridge. The last of the season's zucchinis were eaten last night in a summer salad that I love. I didn't take a photo of it so you have to look at yet another picture of my eggplants! I cant resist their purple plump beauty. This recipe comes from Gourmet Traveller Annual Cookbook 2011 page 171. I haven't put the exact amounts here for the vinaigrette, I rarely use them anyway going with my palate instead. * from the garden. Dry roast the fennel seeds and chilli flakes and then lightly pound in a mortar and pestle. Put in the salad bowl and make a vinaigrette that suits your taste with the oil, lemon juice and red wine vinegar. Add the vinaigrette to the bowl and mix. Take a mandolin and thinly slice the fennel bulb putting it in the vinaigrette as soon as you can, toss thru. (I am having a bad week with my hands - I manged to slice my thumb open while using the mandolin! That added to the chill burns of earlier in the week... I should be banned from the kitchen.) Thinly slice the zucchini and add it to the bowl along with Ligurian olives, torn parsley and spring onions. Toss and serve. This is yummy - enough to get enthusiastic about zucchini. We had this with some fillets of my favourite fish in the world - Flathead. Another sublime day of sun and zephir breeze. All is well with the universe. I don't normally weigh my pick but as I intend to make what I call, 'rocket fuel' today, I need to know what I am playing with. Rocket fuel is a chilli paste or sauce I guess but this chilli paste could easily also be called, 'Devotional chilli paste'. You will see why below - I need to crack on. The newly picked 300gms of red chillies joins two containers of chillies that have been in the freezer from picks earlier this season. Total - 600grams! A friend of mine gave me this recipe some years ago now. It was given to me as a photocopy from a cookbook and I can't say which book it was from, I give you the original amounts here. The original recipe calls this 'chilli jam', but it should be called what it is - rocket fuel - its powerful and not very jammy. A few jars last you forever - or last me forever. The last time I made it was three years ago and we only just finished the last of it a few months ago. My Malaysian work mate gets thru a jar pretty quickly and says it reminds her of an authentic chilli sauce that goes with such and such a Malaysian dish, I will have to ask her which one and will have to pass her a jar as well. The 600 gms of chillies makes for an easy calculation - divide by three. Blend chilli, onion, garlic and oil into a smooth paste in a food processor. Be careful when opening the lid in case it splashes into your eye. The smell can be pretty overpowering to, so be careful of your nasal mucous membranes (and other sensitive bits too!). Cook paste in a wide and heavy pan with a solid base over a very low heat until it turns dark red. This can take some time - the recipe says 12 hours, but from memory I gave up earlier than this the last time I made it and the result was fine.You will need to stir occassionally so it doesnt stick. After 12 hours (or when its redish and you have had enough!) stir in tamarind liquid and palm sugar and cook for another two hours. Spoon into sterilised jars cover with a film of oil and store. Pop in the fridge when you open a jar. The recipe says it stores for 3 months in the fridge. What do I use this with? All sorts of Asian meals and I also put just a tiny little bit into tomato-based pasta sauces. It adds real depth to the flavour without necessarily being hot. So here is the result. After 7 hours cooking I had had enough and popped it into jars. I tasted it and it is just like it was before. Not sure what it would taste like after 12 hours - I guess I will never know! As a Friday evening salve to a week at work, I decided to pickle some of my green cayene chillies. I am sure you feel similarly? Cooking and gardening are like sedatives, calming tonics and antidotes to the rest of the world. And I when you can combine both, there must be an added bonus, right? I used 14 of the 24 long cayene in the freezer to make two small jars. Here they are! But... I have hot little hands suffering from chilli burns. The recipe calls for you to remove the seeds. But the pictures that accompany the recipe are of lovely round sections of chilli. So, following the recipe (or at least the picture) I cut the chillies crosswise into lots of round little discs and then tried to remove the seed. Bad idea! After removing seed from the first 4 cut up chillies, I gave up on the idea of lovely round discs and slashed the side of the remaining chilles and opened them up to remove the seeds. This recipe comes from http://rasamalaysia.com/pickled-chilies/ but I put my version here as well. Prepare the chillies by de-seeding and cutting crosswise. Place in a bowl and blanch by pouring on boiling water and steeping for 10 minutes. Drain and discard water. Add to the bowl the salt sugar and vinegar and mix. Stir and then transfer to sterlised jars. On this evening's post-work garden sojourn, I found another broken branch on my long cayene. A branch with 6 fabulously long chillies snapped clean off. I now have a total of 24 long chillies in the freezer! I am obviously not vigilant enough with staking, I think I have learnt my lesson now. Next year when I grow these beauties I will stake, stake, stake. I think I am going to have to make some pickled chillies over the weekend. Might try these recipes. I think we might be at the end of the tomatoes for the year. The plants look unhappy, the fruit on the broad yellow ripple currant tomatoes are much smaller than usual and same for the sugar lumps. I think they might get pulled out next weekend. The only tomato variety that seem a little happier are the brown berries. They might stay in a little longer? Let's see next weekend. My cucumbers seem to have been found by huge numbers of aphids - more than I can control really. Where did they come from in just a day or two? They might end that crop too! The eggplant are still powering on as are the chillies. Oh well, it was a strange summer, but the water tank is full, the limes and lemons nice and juicy and I haven't had to get the hose out much so I guess that is all positive. The mind drifts to brassicas and snow peas...and the hungry gap. Tonight its homemade (and homegrown) basil pesto - its being made as I type - that's the chink, bang, bang, bang, chink, bang you can hear in the background... with some roasted sugar lump tomatoes on top. Mmm. 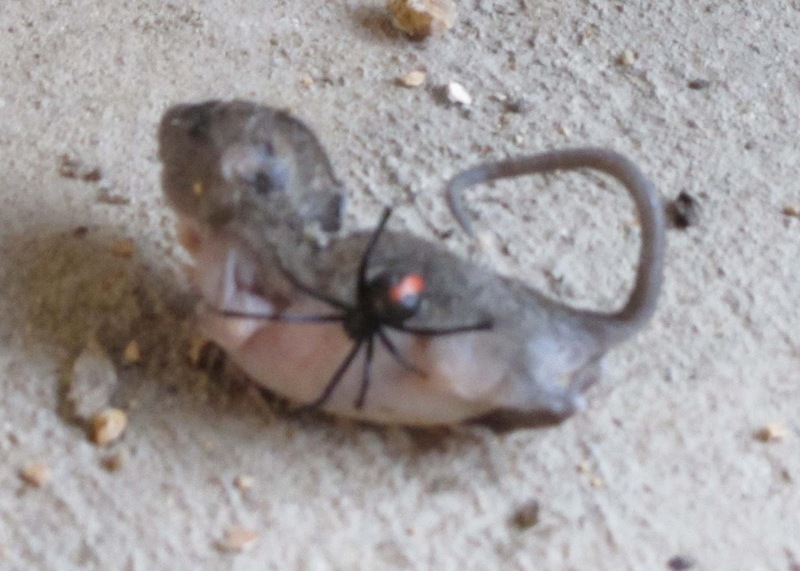 We had noticed a very large red-back spider inside our shed lately. Figuring she has a right to life, we have left her alone knowing where she prefers to spin her web and keeping our distance. Today, a weird scene awaited us. A baby mouse (or rat? ), slighlty mumified and madam red-back atop. Had she killed it? What would she do with it now? For those non-Australians in the readership, the red-back is one of Australia's fabled 'poisonous' spiders, endemic to the suburban backyard. If you think me foolhardy, you probably need to take into account that as a Primary School student before there were anti-venines for the more poisonous funnel-web, I was taught how to collect them and take them alive and healthy to the Council for 'milking' of their venom so that they could develop an antidote. I am not afraid of spiders. A sunny morning got me into the patch early. I picked a big basket of tomatoes and chillies before heading to the market. On return I decided that the zucchini was on its last legs and so it was removed. I also decided that the zebra tomatoes I had planted back in October really just hadn't thrived. At first I thought that was becasue they got too much shade but I dont think the season helped. They thickened up a bit on removal of the wattle but they were a sad case of sprawly growth with a few fruit fly infested green orbs despite my yellow glue traps! So they came out too. Hmm, space to plant! So spring onions, two types of parsley, broccoli, beetroot seed and some violas went in. I grow both types of parsley - I like them both. But the curled parsley seems to have suffered with the wet weather and have gone a bit soggy and rotted. The Italian parsley has coped much better. David made tabouleh to go with falafel and hommous for lunch - great way to deal with a big bunch of parsley! This recipe is adapted from a very old Tess Mallos cookbook - The Complete Middle East Cookbook. It's been very well used and is a little worse for it. I think that it might be late '70s or early '80s when Lebanese food started to become popular in Sydney. Suddenly even the most dedicated Shire-dwelling WASP family was serving hommous and flat bread at dinner parties. We ate with our hands and started using words like tahini and baba ghanoush - words that still sound so great in the mouth. I even dabbled with 6 months of Arabic at Sydney Uni and regularly headed off campus at lunch time to grab a falafel roll from Maurice's in Newtown. To this day I think they were the best falafel rolls I have ever had. Maurice's little corner shop has been empty for years. Anyway, I felt very sophisticated when the mother of a boyfriend of mine gave me this book one birthday or Christmas. Thanks Pat - who'd guess that it was still in use. Well used Tess Mallos cookbook - thanks Pat! Soak burgul in cold water for 30 mins or so and squeeze water out. Chop all greens finely and add to a bowl with cherry tomatoes. Stir thru burghul. Mix oil and lemon juice together with pepper and mix thru the salad. And how is the beetroot glut going? Well today I decided to get over my morbid fear of the pickled beetroot and decided to take the plunge. I followed Rhonda's recipe and the result is one beautiful jar full of beetroot. I could have probably made two jars but what if I don't like them? So I still have quite a few fresh ones left over. Aren't they a beautiful colour? My lusted after beauty called "Collette" arrived late in the week from Daley's in Kyogle all upright and protected in a fab cardboard box. This spikey lass will produce black shiny fruit and dark lime green pulp. Here she is! Help! I have a compost crisis. What is the best thing to do when you have a maggot invasion? Is it a problem or not? Or is it just yucky? To add or not to add lime? To add or not to add more carbon? Relax and let them munch and squirm? Turn the bin out and hope the birds pick thru it? I never put meat or dairy in the bin. Tonight is Friday night pizza night - all homemade and garden focussed! David did the honours including home made yeasty bases. Yum. One pizza with roasted cherry tomatoes*, eggplant*, fetta and oregano*. Another with a basil* pesto base, zucchinis*, mushrooms and black olives. Heat oil in roasting pan, toss in vegetables cut into small chunky bits add bay leaves and roast until everything is crunchy and caramelised and the insides are soft. Leave the skin on the cucumber, smash the cucmber with a Chinese cleaver or other heavy knife, when open remove the excess seedy bits (mine are quite seedy at the moment!). If the smashing doesn't give you small enough pieces break the rest up with your hands. Breaking or smashing it rather than cutting it really is a feature of la ban huanggua and gives you a nice chunky texture. Add garlic and chillies and mix. Heat a small amount of peanut oil in a saucepan and when smoking pour over cucumber, it'll crackle. Then add a little Shaoxing wine and Chinese white vinegar. I think the vinegar really makes it. If you like a little chopped coriander is good too. I had to pick most of the beetroot today. The swollen purple roots were sitting on top of the ground. Had I left them much longer I swear they would have pushed themselves completely out of the ground. I hope I havent left it too late - will they be too hard and woody? Or maybe not after the mild summer. We will find out very soon. I have officially declared this week as 'beat the beet week'. I think we are going to have to be pretty serious about eating them to get the numbers down to a reasonable level. Tonight I am trying Suburban Tomato's Beetroot, fetta and mint salad but think I will use vin cotto (just becasue I have it) with olive oil in my dressing instead of ST's suggestion. Might also be nice with some roasted pine nuts. What a beautiful day, warm and sunny, not too hot, just hot enough. A bit of light pottering in the patch was the order of the day. Some of the tomatoes had sprawled a little too much and I removed the sprawling bits so that other things wouldn't get smothered. Needed to do a bit of weeding, what with the rain things were a little out of contol but soft damp soil made for simple removal. The long cayene needed a bit of staking - it too had got a little too leggy and needed some support, but in staking it I accidently broke some branches that were heavy with fruit. Damn! Serve me right for delaying the staking! Anyway I have saved the fruit and will probably make green curry paste next weekend. In the meantime they are in the freezer. Its such a shame - I would love to have seen them red. More wildlife? 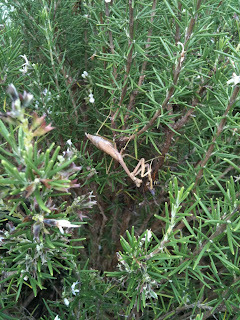 We get the most amazing giant praying mantis in our garden. I saw one again today. One year when the lomatia was flowering heavily I sat and watched a giant praying mantis hunt the bees that came to the blooms. It would freeze near a flower head and wait patiently (what anthropomorphism - how do I know it was patient!) and then stike with its barbed long front legs and quickly snap the bees onto its barbs. It would then eat the bee head first. What would it do with the barb at the end of the bee, we wondered? Surely it would throw that bit away? No - the praying mantis ate every scrap of the bee. I watched it facinated for at least half an hour as it, one by one, ate bees. Since then, each spring and summer we have spotted numerous giant praying mantis in the garden and noticed its egg cases positioned on those plants that have prolific flowers across the garden. What? A non-gardening Saturday? How can that be? Yep! I spent the whole day looking and applying for jobs. Oh well, at least it wasnt raining! Tank full and ground watered everything is back into growing mode now that the sun has come out again. With the frogs 'plonking' away in duets and mozzies buzzing my ankles (both have enjoyed the wet season! ), I provide tonight's recipe. This is 'a Jamie' ( you know who I mean), it is such a favorite that I dont look at the recipe anymore so I provide my version to share with you. It has a few added extras that I think work (chillies and shallots). It's from the irritatingly titled, "Happy days with the naked chef", but I do like his food and I remember fondly how bright and colourful his books looked to me during our 5 years in England and that makes me feel good about any daft title. Fancy that, a Jamie book is an antidote to seasonal affective disorder. Perhaps it should be prescribed along with sun-imitating light bulbs! Heat roasting pan with olive oil in oven. Add peeled shallots and the tops of your fennel - the stalky and feathery bits and cook for a bit. Heat water in a saucepan and blanch fennel bulbs cut into quarters. Remove with slotted spoon and add to tray along with tomatoes, garlic, olives and thyme. Drizzle with more olive oil and either Vermouth, or white wine or lemon juice and roast until everything looks yummy and the tomatoes have started to split and ooze. I often also pop into the same pan salmon fillets and cook all together. I make it so often that I say to myelf, 'come on, surely you could be a little more imaginative? ', but then I eat it and remember why it is such a favorite. 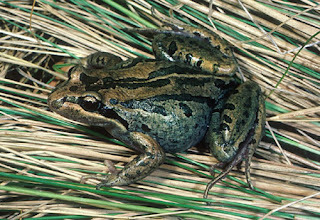 Back to the frogs. I have now found out that our frogs are striped marsh frogs, apparently one of the first to colonise backyard frog ponds and a 'voracious hunter'. Not voracious enough! I wish they would eat the mosquitoes! Just noticed the similarity betten Harriet and the plonkers? Grey-brown stripes! Harriet is not a voracious hunter thankfully! Zucchinis terrific! Like bunnies, prolific! Dream come true - padron seeds! Padron seeds! Shame it's not planting season, but padron are no longer unattainable. I am liking this blogging caper! Thanks to L from 500m2 in Sydney and her referral to the Italian Gardener. Now I can dream of next spring, look at my packet of seeds and know that piles of hot pardon with their little green skins all blistered, scattered with a little sea salt and accompanied by a glass of fino is not that far away. And I am going finger lime hunting this weekend. Today our yard was a baby bird creche. It seems that Laurie and Keats have two babies. Both turned up today driving their parents to distraction. The babies were engaging in adolecent risk-taking behaviour. Instead of staying safely up on the balcony rail away from Harriet (who isnt really a bird catcher and who was hiding from the wet weather and nowhere to be seen) they doodled around on the stairs of the deck and grazed on the grass without a care. Their parents wildly screetched at them while they were doing this as if to say, "what are you doing down on the ground, you are a bird - the cat will get you!" Tonight it's Chinese Spicy Eggplant for dinner (see Techno bimbo for recipe). Uses lots of eggplants, garlic, chillies and spring onions!